On Tuesday, Tesla will open their second Supercharger location in Texas, and are planning to open several more by the end of the year, despite being blocked from selling cars in Texas. Tesla Motors is about to open a new Supercharger station in Waco TX, a state where they cannot even sell cars. The new station will open on Tuesday, in a 10 AM ceremony, at 701 N. Interstate 35 in Bellmead, next to the Collin Street Bakery just north of Waco. The location will serve Tesla owners traveling between Austin, Dallas/Fort Worth and San Antonio. It will have eight charging stalls. Because Tesla sizes the Supercharger network based on local population, this indicates there are already a lot of Model S owners in Texas, or that that Tesla believes there will be a lot of them. Most of other Supercharger locations are located near other potential destinations a driver might want to wait while charging their car. Such as in a rest area parking lot that's full of restaurants. This location is a little curious because this location, in the parking lot of a restaurant, doesn't have many attractions within a walkable radius. Besides the restaurant, that is. Because there are no sidewalks and the roads are 50 miles/hr roads, the neighborhood is not designed for walking, and the Sams Club a couple hundred yards away might as well be on the Moon. That means Model S owners stopping at this Supercharger location had better be happy with the Collin Street Bakery, because they essentially don't have any other choice. There are about 700 Tesla cars in Texas. Buying them in Texas means the customer purchases the cars directly off the Tesla website, receiving delivery instructions directly from Tesla. While the company has "galleries" in Houston and Austin, Tesla's Texas employees are not allowed to give test drives nor even discuss purchase terms. This is thanks to Texas' strict car franchise laws which have stymied the companies efforts to have a better sales experience in Texas. There is already one Supercharger location in Texas, in San Marcos, a small city located between Austin and San Antonio. The company says they'll shortly open another in Columbus Texas, located between Austin and Houston. 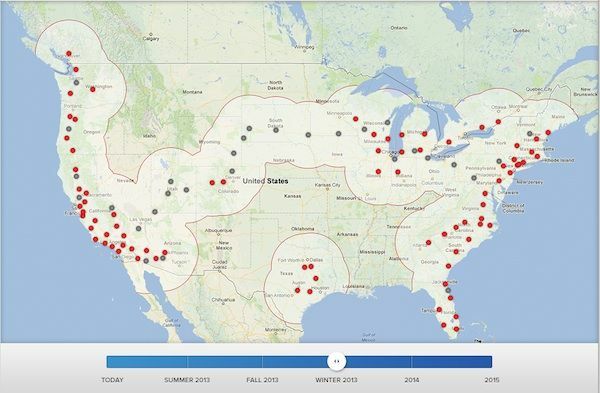 By the end of the fall Model S owners will be able to travel the "Texas Triangle" using Supercharger stations.